Our template is very similar to Henne’s template (Kelly, 2009), which consists of learning objectives, see table 1 for comparison of the two templates. Table 1. 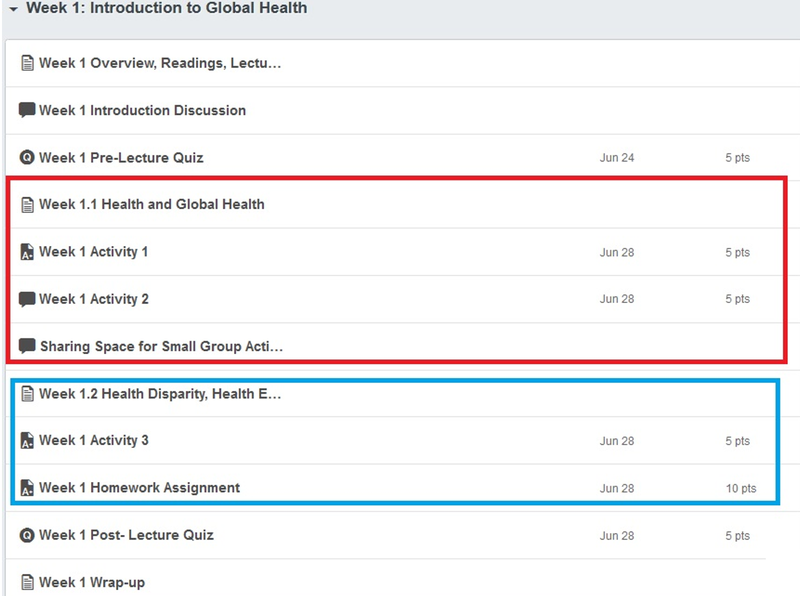 Comparison of Global Public Health – H 333’s course design template and Henne’s course design template. This weekly modular template, however, should not limit us from organizing learning content into even smaller units within a weekly module. 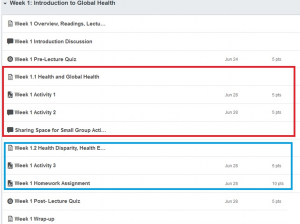 Here is an example of two modular learning content units within one week in Global Public Health – H 333. The highlighted boxes show two modular content units within Week 1. Therefore, if you have a course that has heavy content within each week, feel free to break them into smaller learning modules instead of putting them together as a long big piece. Enjoy designing and teaching online in Canvas. Crowder, L. (2011). How to develop modular content in 4 easy steps. retrieved from http://www.learninghouse.com/blog/publishing/how-to-develop-modular-content-in-4-easy-steps on July 28, 2015. Downes, S. (1998). The Future of Online Learning. Online Journal of Distance Learning Administration, Volume I, Number 3, Fall 1998. State University of West Georgia, Distance Education Center. Institute-wide Task Force on the Future of MIT Education: Final Report, July 28, 2013, pp. 49–50.